A decade or more ago, the debate about dark matter was, is it due to WIMPs (weakly interacting massive particles) or MACHOs (massive compact halo objects)? WIMPs would be new exotic particles, while MACHOs are objects formed from ordinary matter but very hard to detect due to their limited electromagnetic radiation emission. Candidates in the MACHO category such as white dwarf or brown dwarf stars have been ruled out by observational constraints. Black holes formed in the very early universe, dubbed primordial black holes, were thought by many to have been ruled out as well, at least across many mass ranges, such as between the mass of the Moon and the mass of the Sun. The focus during recent years, and most of the experimental searches, has shifted to WIMPs or other exotic particles (axions or sterile neutrinos primarily). But the WIMPs, which were motivated by supersymmetric extensions to the Standard Model of particle physics, have remained elusive. Most experiments have only placed stricter and stricter limits on their possible abundance and interaction cross-sections. The Large Hadron Collider has not yet found any evidence for supersymmetric particles. The black holes observed in these events have masses in a range from about 8 to about 36 solar masses, and they could well be primordial. then a black hole will form. The above equation defines the Schwarzschild limit (G is the gravitational constant and c the speed of light). A PBH doesn’t even have to be formed from matter whether ordinary or exotic; if the energy and radiation density is high enough in a region, it can also result in collapse to a black hole. Cosmic string loops – If string theory is correct the very early universe had very long strings and many short loops of strings. These topological defects intersect and form black holes due to the very high density at their intersection points. The black holes could have a broad range of masses. Bubble collisions from symmetry breaking – As the very early universe expanded and cooled, the strong force, weak force and electromagnetic force separated out. Bubbles would nucleate at the time of symmetry breaking as the phase of the universe changed, just as bubbles form in water as it boils to the surface. Collisions of bubbles could lead to high density regions and black hole formation. Symmetry breaking at the GUT scale (for the strong force separation) would yield BHs of mass around 100 kilograms. Symmetry breaking of the weak force from the electromagnetic force would yield BHs with a mass of around our Moon’s mass ~ 10^25 kilograms. Density perturbations – These would be a natural result of the mechanisms in #1 and #2, in any case. When observing the cosmic microwave background radiation, which dates from a time when the universe was only 380,000 years old, we see density perturbations at various scales, with amplitudes of only a few parts in a million. Nevertheless these serve as the seeds for the formation of the first galaxies when the universe was only a few hundred million years old. Some perturbations could be large enough on smaller distance scales to form PBHs ranging from above a solar mass to as high as 100,000 solar masses. For a PBH to be an effective dark matter contributor, it must have a lifetime longer than the age of the universe. BHs radiate due to Hawking radiation, and thus have finite lifetimes. For stellar mass BHs, the lifetimes are incredibly long, but for smaller BHs the lifetimes are much shorter since the lifetime is proportional to the cube of the BH mass. Thus a minimum mass for PBHs surviving to the present epoch is around a trillion kilograms (a billion tons). Carr et al. (paper referenced below) summarized the constraints on what fraction of the matter content of the universe could be in the form of black holes. Traditional black holes, of several solar masses, created by stellar collapse and detectable due to their accretion disks, do not provide enough matter density. Neither do supermassive black holes of over a million solar masses found at the centers of most galaxies. PBHs may be important in seeding the formation of the supermassive black holes, however. Microlensing surveys such as MACHO and EROS have searched for objects in our galactic halo that act as gravitational lenses for light originating from background stars in the Magellanic Clouds or the Andromeda galaxy. The galactic halo is composed primarily of dark matter. A couple of dozen of objects with less than a solar mass have been detected. Based on these surveys the fraction of dark matter which can be PBHs with less than a solar mass is 10% at most. The constraints from 1 solar mass up to 30 solar masses are weaker, and a PBH explanation for most of the galactic halo mass remains possible. Similar studies conducted toward distant quasars and compact radio sources address the constraint in the supermassive black hole domain, apparently ruling out an explanation due to PBHs with from 1 million to 100 million solar masses. Lyman-alpha clouds are neutral hydrogen clouds (Lyman-alpha is an important ultraviolet absorption line for hydrogen) that are found in the early universe at redshifts above 4. Simulations of the effect of PBH number density fluctuations on the distribution of Lyman-alpha clouds appear to limit the PBH contribution to dark matter for a characteristic PBH mass above 10,000 solar masses. Distortions in the cosmic microwave background are expected if PBHs above 10 solar masses contributed substantially to the dark matter component. However these limits assume that PBH masses do not change. Merging and accretion events after the recombination era, when the cosmic microwave background was emitted, can allow a spectrum of PBH masses that were initially less than a solar mass before recombination evolve to one dominated by PBHs of tens, hundreds and thousands of solar masses today. This could be a way around some of the limits that appear to be placed by the cosmic microwave background temperature fluctuations. Thus it appears could be a window in the region 30 to several thousand solar masses for PBHs as an explanation of cold dark matter. As the Advanced LIGO gravitational wave detectors come on line, we expect many more black hole merger discoveries that will help to elucidate the nature of primordial black holes and the possibility that they contribute substantially to the dark matter component of our Milky Way galaxy and the universe. Baryon acoustic oscillations (BAO) are the acoustic (sound) waves that occur in the very early universe due to very small density inhomogeneities in the nearly uniform fluid. These primordial acoustic oscillations have left an imprint on the way in which galaxies are spatially distributed. The characteristic scale length for these oscillations is around 500 million light years (in the frame of the present-day universe). A spatial correlation function is used to measure the degree to which galaxies and clumps of matter in general, including dark matter, are separated from one another. The characteristic length scale serves as a standard ruler for very large-scale clustering, and is seen as a distinctive break (change in slope) in the power spectrum of the degree of spatial correlation vs. distance. An international consortium of astronomers representing 29 institutions have submitted a paper last month to the journal Astronomy and Astrophysics; the current version can be found here (http://arxiv.org/abs/1211.2616). They used a clever technique of detecting clouds of neutral hydrogen along the line of sight to a large number of quasars with high redshifts. Thus the matter clumps in this case are neutral hydrogen clouds or neutral hydrogen within intervening galaxies or proto-galaxies. These absorb light from the quasar and produce absorption lines in the spectrum at discrete locations corresponding to various redshifts. The authors are detecting a characteristic transition known as the Lyman alpha line, which is found well into the ultraviolet at 121.6 nanometers (for zero redshift). For this work over 48,000 high-redshift quasars, with a mean redshift of 2.3, were taken from the 3rd Sloan Digital Sky Survey. A quasar may have many hydrogen clouds intervening along the line of sight from the Earth to the quasar. These clouds will be seen at different redshifts (less than the quasar redshift) reflecting their position along the line of sight. This is referred to as the Lyman alpha “forest”. This study is the first application of Lyman alpha forest measurement to the detection of the BAO feature. At the average red shift of 2.3, the wavelength of Lyman alpha radiation is shifted to 401.3 nm [calculated as (1+2.3)*121.6 nm], in the violet portion of the visible spectrum. The study incorporated redshifts from the absorbing clouds in the range of 1.96 to 3.38; these are found in front of (at lower redshift than) quasars with redshifts ranging from 2.1 to 3.5. Speedup or slowdown versus age of universe. The Big Bang is on the left, 13.7 billion years ago. The BAO feature has been measured a number of times, using galaxy spatial distributions, but always at lower redshifts, that is at more recent times. This is not only the first Lyman alpha-based measurement, but the first measurement made at a high redshift for which the universe was still slowing down, i.e. the expansion was decelerating. At the redshift of 2.3, when the universe was only about 3 billion years old, the gravitational effect of dark plus ordinary matter was stronger than the repulsive effect of dark energy. It is only more recently, after the universe become about 9 billion years old (some 5 billion years ago), and corresponding to redshifts less than about z = 0.8, that dark energy began to dominate and cause an acceleration in the overall expansion of the universe. 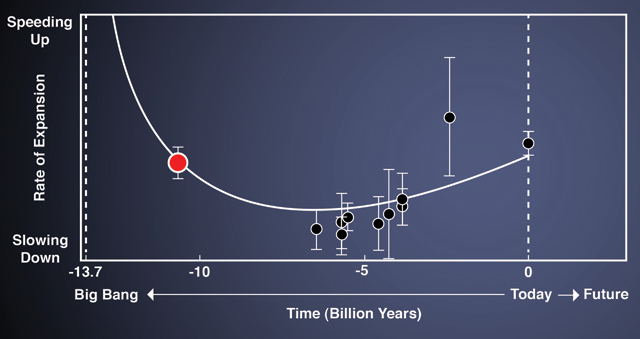 Since this observation shows a significantly higher rate of expansion than occurred at the minimum around 5 billion years ago, it is further evidence that dark energy in some form is real. As the authors state in their paper: “Combined with CMB constraints, we deduce the expansion rate at z = 2.3 and demonstrate directly the sequence of deceleration and acceleration expected in dark-energy dominated cosmologies.” This is an exciting result, providing additional confirmation that dark energy represents around three-quarters of the present-day energy balance of the universe.